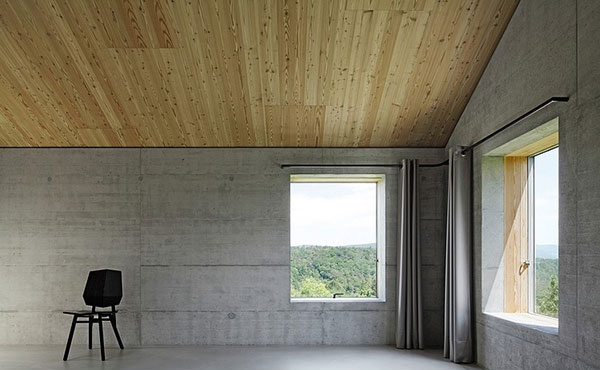 A beautiful and unique house in Au, Switzerland is considered privileged being the last house to be built in Nuglar, in the canton of Solothurn. It is designed parallel to the landscape giving it a magnificent view of the surroundings. The homeowners of House D could get a gaze over verdant land with mature fruit trees but aside from the good view one can get, it also boasts its architecture as well as its interior design. The main level of the house has a kitchen, dining and living area stretched on an open layout. It is glazed and seamlessly blends with the outdoor space which is an oversized elevated terrace made of wood decking and a pool. The terrace is done this way since the homeowners did not want a garden that he would need to maintain. The elevated living space keeps its privacy from passersby. 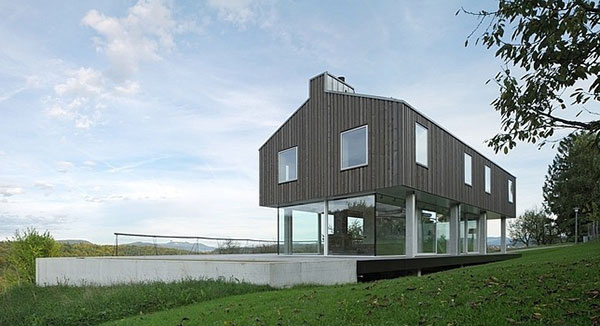 The house has a simple design using three basic materials of wood, glass and concrete. 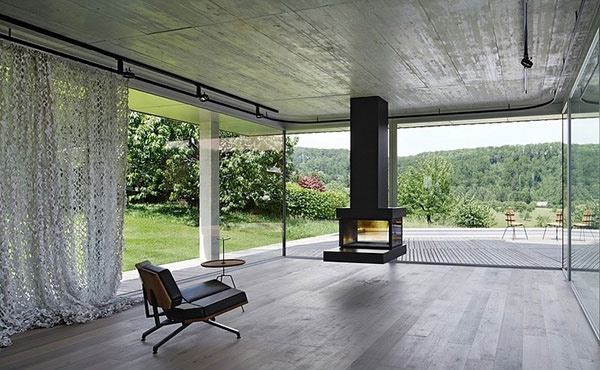 The outdoors would show us a simple and straightforward look which is also extended in the interior. Instead of adding complicated details to the house, they made use of industrially made products. 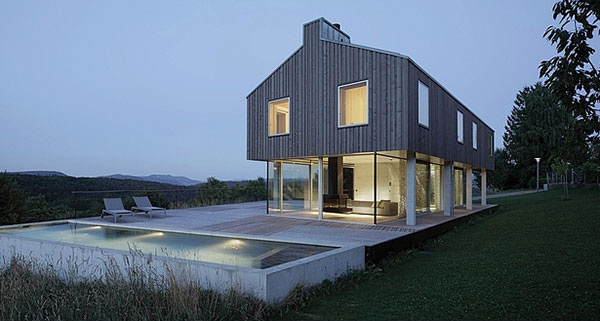 Now, let us look into the images of House D by HHF Architekten. This is a modern house with an industrial look in its exterior. You can see the glass on the lower area and the terrace made of wooden decking. The house sits on the slope of this area making it appear even more unique. Talk about organizing a shoe collection! The concrete is still left unfinished in this wall for an industrial interior. Those white chairs are indeed favorites for designers especially that it can fit well in whatever interior. Look at those curtains, we are not sure of its material but it is a perfect choice for this dining area. A black glossy kitchen which doesn’t just keep all the stuffs in the kitchen but also looks gorgeous. An empty space- we are not sure what this area is for but with this shot, we could clearly see the materials used in the interior. Wooden flooring and ceiling seems to meet as glass walls stand in between them. Notice that modern suspended fireplace too! 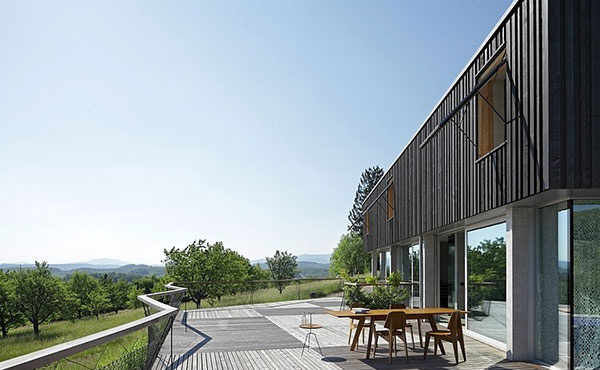 The house is surrounded with this terrace of wooden decking. Notice that the wood is arranged in both horizontal and vertical manners. Nice design, right? 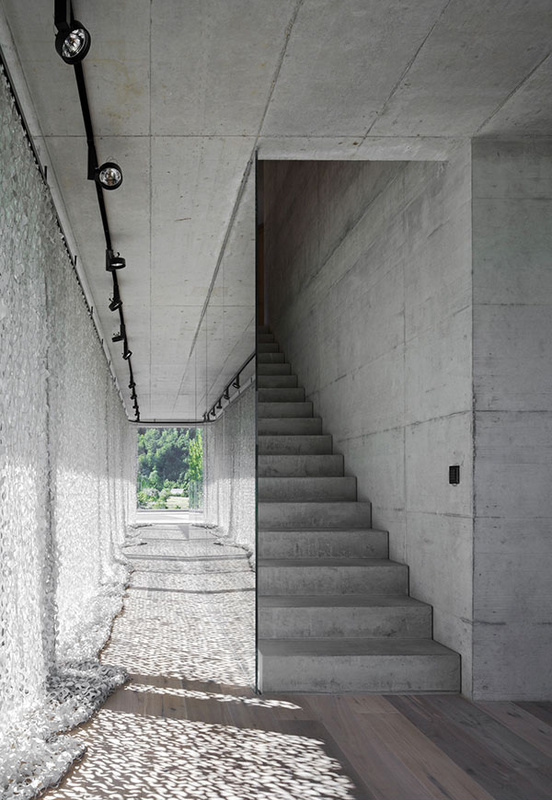 Concrete stairs leads to the upper area of the house and it has glass railings on the side. Aside from the sloped ceiling, we can see that even the door is sloped too! We totally find this distinct! This is a floor plan of the house. It really has a spacious terrace! 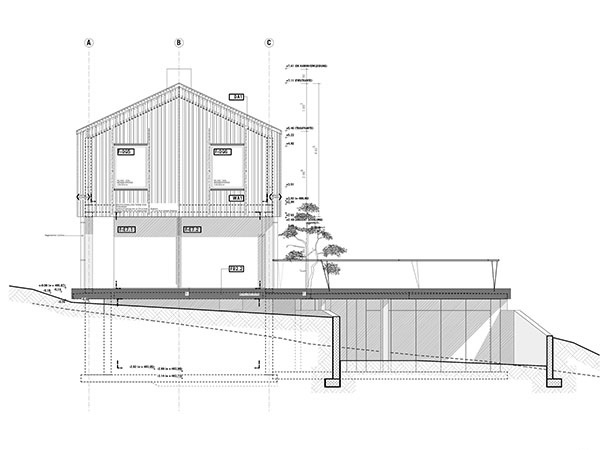 Seen here is the elevation of the house where the slope and the structure is clearly illustrated. 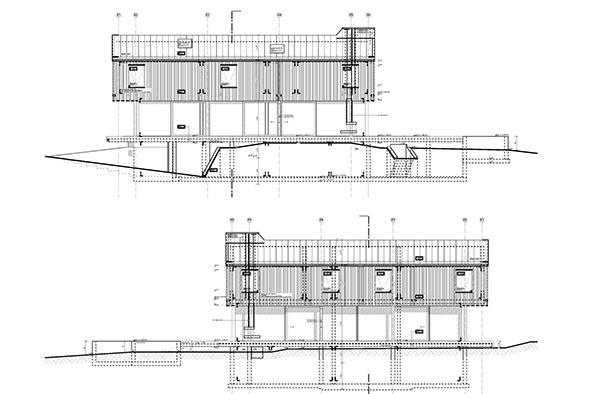 Elevation of the house on the front and rear areas are seen here. It looks simple but it sure is beautiful. 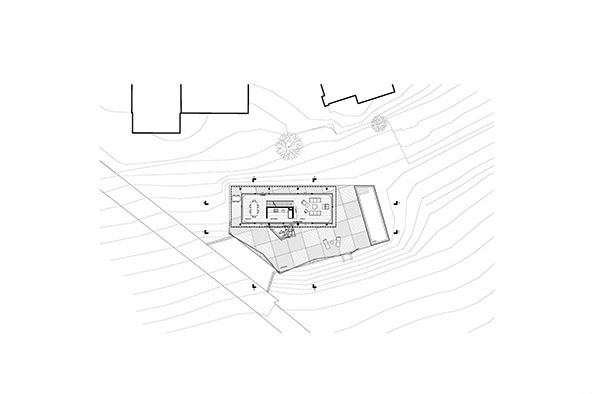 The cross section of the house shows the basement and even the below ground pool. 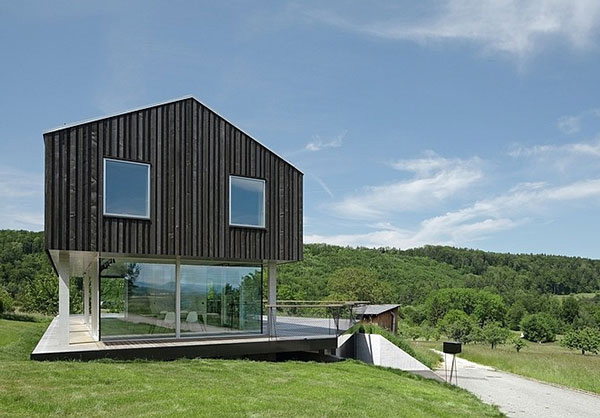 This angle of the house shows us the rare design of its exterior. House D occupies 241 sq.m. on three floors with three bedrooms, three bathrooms, an office, a gym and living spaces. There is a separate garage with a space big enough for four cars giving one a direct access into the house. 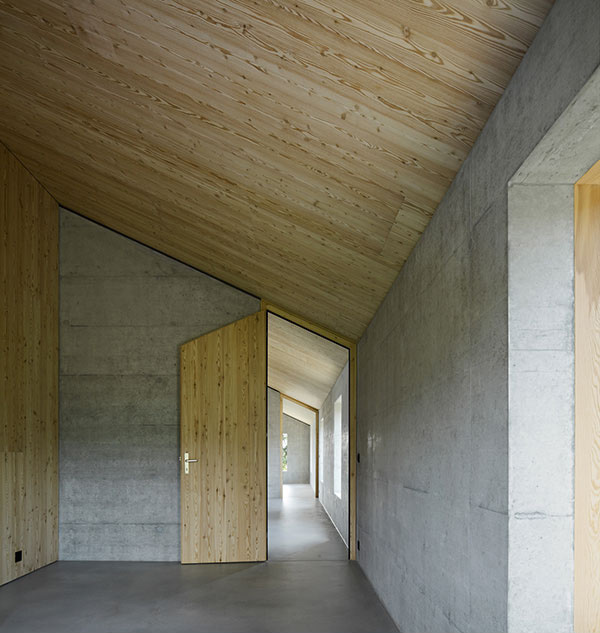 The interior of the house looks intriguing as it has untreated wood ceilings and doors. But yes, the look might be different but the term “simple” could be an understatement since it actually has style despite its simplicity. 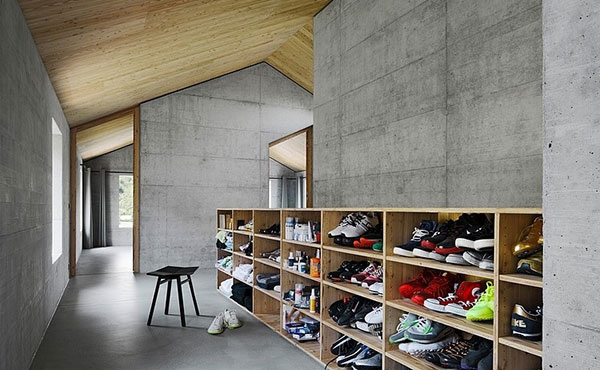 The HHF Architekten must be proud of this project which could be the reason why House D had been featured in different sites online.